The first disc on the St Louis based Bamboo concern may well have been the best – although some of the Lee Charles releases are worth investigating. 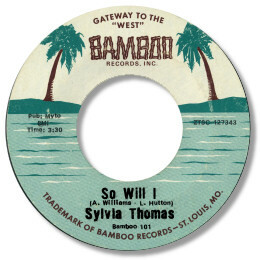 Sylvia Thomas has one of those deep smoky voices that sound so good on blues based ballads like this. And what a great sense of dynamics she shows, particularly when she goes into the higher registers. Love the arrangement to this 6/8 time tune as well - the horns are excellent, with the baritone sax nicely to the fore, and the pianist (could it be Oliver Sain?) doodles away to very good effect and the congas add a nice touch. This is heavy heavy soul to savour. Note - The Sylvia Thomas on K & K is a different artist - don't waste your money like I did!